As kids, we have this amazing ability to turn anything and everything into an adventure. Our imaginations are fantastic, plugging away at unprecedented speeds and creating interesting things out of the mundane. At some point we lose that ability to play, perhaps during our teenage years or in college, but those memories that we create stay with us forever. 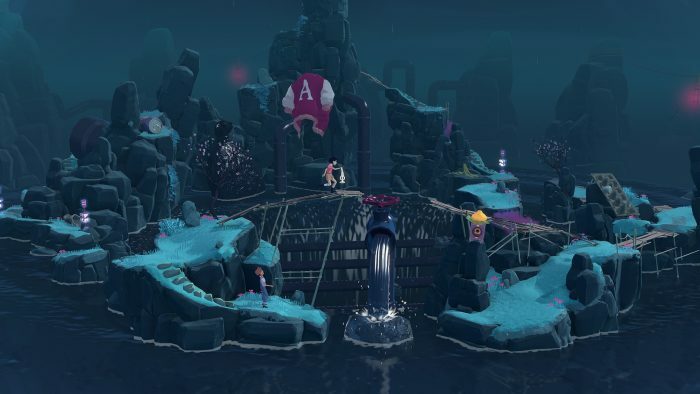 The Gardens Between embraces those memories, bringing them to life in a game that is both heartwarming and enjoyable, and filled with novel executions of puzzles based on nostalgia. The Gardens Between stars two childhood friends, reliving their memories together through island-like adventures. Their youth translates into imagery and puzzles involving VCRs, video games, swing sets and forts, and how they use their imaginations to make their way around. The ultimate goal of each “island” is for the duo to carry a magic lantern to its peak, light a gate and walk through. The characters are never too far apart, often calling to or waving at each other, and keeping themselves safe by pointing out obstacles. These are two best friends who genuinely care about one another, and it shows in every part of the experience. The interesting conceit of the game, however, is that we don’t control the actual characters but the flow of time around them. Through slight pushes of the analog sticks, we’re only advancing a memory, like playback on a VCR, or rewinding it backward. There are key points that seem to transcend time, and if a character comes across one (a bell, a keypad, an empty lantern) we can motivate them to interact with it by lighting it up. Because of this, different situations unfold that let us solve a puzzle in our way. In one section, the duo hops across a number pad on their way up. Blocking the path near the top is a gate that requires the correct numbers pushed in order to unlock. As we rewind on the way back down, we pass a rotating number spool that helps identify what the correct passcode is, which, when we reach the keypad, require us to nudge forward and reverse time to get in the right order. Once we do, the gate opens and we can move ahead. The game is filled with puzzles like these, from the simple to the complex, but I feel like it all emphasizes one giant, major thing: We don’t control the kids, we only serve to play out their memories. We spin time but only watch them react, not *make* them react. We’re at their whim, really. We don’t actually know how they’ll solve puzzles, or even if they’ll do anything at all. They don’t even always go in the direction that we expect them to, causing us to rethink how we help them next. It’s indicative of parenting. We watch our kids grow, have fun, play, and we nudge them along, but ultimately we let them go their own path. We let them make mistakes and learn. And by the end of the entire experience we end up feeling like we’ve accomplished something by watching the two kids live and explore and love. It isn’t a long game — it’s only a couple of hours — but it’s the perfect length to guide us on its narrative. The puzzles aren’t difficult, but aren’t always obvious, either, prompting us to revert to thinking like a child instead of an adult to solve many of them. The visuals are colorful and poppy, like the subject matter of nostalgia, and the interstitials and constellations only help to embed the memories in us, or spark the return of some that we ourselves may have forgotten. The Gardens Between is about two friends going on adventures. Or rather, it’s about us, and our recollections of childhood, and how we should let our imaginations guide us so that our memories never fade. This review is based on a review code for the Nintendo Switch sent to SideQuesting by the publisher.